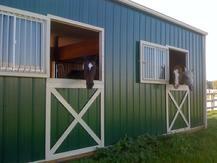 All horses in our 24 stall main barn have access to fresh air with dutch windows or sliding doors and stall gates. 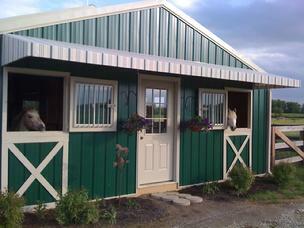 Our stalls are 12' x 14' and 12' x 12' complete with full rubber mats systems. Between the heat in the winter and air ventilation system in the summer the barn stays a relatively constant temperature keeping horse and rider comfortable and healthy year around. 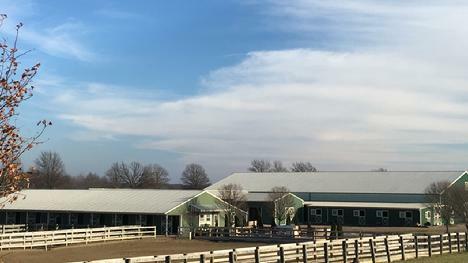 Together with full security and video cameras and fire alarm systems in all barns, concrete aisle, indoor and outdoor wash stall with hot and cold water, grooming stalls, lounge, tack, bath room and offices the barn offers all the amenities for the horse and riders comfort. The main barn of 24 stalls is heated with an excellent air exchange for healthy horse and rider. 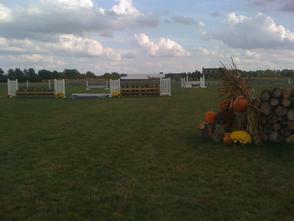 We have two outdoor riding areas, an outdoor sand ring that measures 100' x 220' and a grand prix field measuring 400' x 900' complete with jumps, ditch, bank and water. Temperature controlled Lounge and Tack Room with full viewing window to indoor and equiped with comfortable furniture and kitchen. Our outdoor ring has an elevated deck with bar, tables, refrigerator and a grill! We have a seperate 10 stall barn that is open with dutch windows in most stalls and three oversized with attached run in sheds for the minis and a babies to frolick. Barn is heated in winter with floor radiant heat system. We are very proud to have an area to retire our horses. We feel very strongly about taking care of every horse when they retire. We currently have a 8 stall barn with all weather paddocks and lots of grass paddocks to keep our retired horses happy and safe. Stalls remain open when weather permits so horses can choose to be in or out. Pictured our two old timers who had very successful hunter careers and have been retired for several years, they are such good friends that they are together always.